Hogmanay is the Scots word for the last day of the year and has become synonymous with exuberant Scottish New Year Celebrations. A fun evening of celebrations and wonderful food, why not enjoy the celebrations at a Scottish cottage or apartment this Hogmanay? 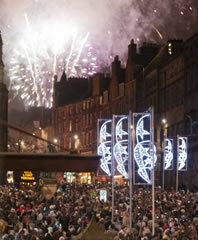 In the cities of Scotland (including Glasgow, Edinburgh and Aberdeen) thousands of revellers take to the streets on New Year's Eve to see in the New Year. Building up throughout the evening, Hogmanay is traditionally capped by a lone piper playing just before midnight, followed by the New Year bells and the singing of the traditional Auld Lang Syne. Of course, each area of Scotland has their own Hogmanay customs and traditions with the widest practised being First Footing - which starts immediately after midnight and involves the first person (preferably a tall dark stranger) over the threshold giving gifts and receiving food in return, bringing good luck for the year ahead. You will find Hogmanay celebrations across Scotland but popular ones include Edinburgh, Glasgow, Aberdeen, Stirling, Inverness and Stonehaven. Please note that the cottages selected above are cottages available during December/January but may now be available as this page is not linked to live booking. Click on the links and booking buttons to find live availability. Not surprisingly, availability of cottages over Hogmanay and the New Year break are limited and sell out quickly. Therefore as well as checking online we would also recommend calling 0844 847 1143 to find out the latest availability for cottages, apartments or lodges.